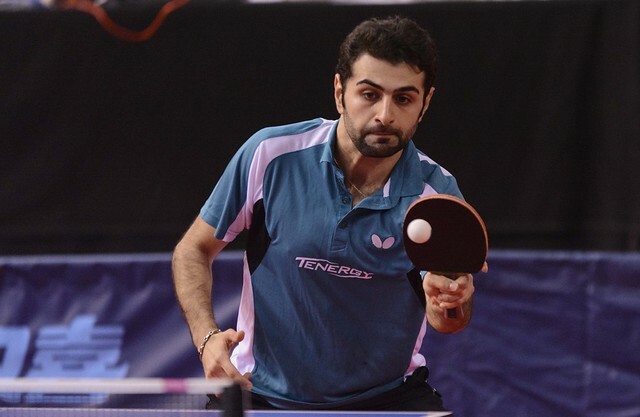 Impressive performances, hard earned successes, India’s Sathiyan Gnanasekaran and Japan’s Hina Hayata won the respective Men’s Singles and Women’s Singles titles at the 2017 ITTF Challenge Spanish Open in Almeria on Sunday 26th November. Meanwhile in both the Men’s Doubles and Women’s Doubles events it was success for Korea; Cho Seungmin and Park Ganghyeon combined to win the former, the latter finished in the hands of Jeon Jihee and Yang Yaeun. Defeat for Lam Siu Hang who the previous day had won the Under 21 Men’s Singles title, in the counterpart semi-final it was also defeat for Hong Kong; Ng Pak Nam the no.14 seed, was beaten by Kazuhuri Yoshimura (11-7, 3-11, 11-6, 13-11, 11-7). Success for Sathiyan Gnanasekaran, for Jeon Jihee it was agony in her effort to regain the title she had won two years earlier. Just as earlier in the afternoon partnering Yang Haeun and occupying the top seeded position in the competition, it had been success against India’s Manika Batra and Mouma Das, the no.2 seeds, by the very narrowest of margins (9-11, 11-6, 9-11, 11-9, 11-8), so in the Women’s Singles final, it was the reverse situation. The second seed, she was beaten by the minimal two point margin in the decisive seventh game by Hina Hayata, the top seed (5-11, 11-2, 6-11, 11-9, 11-3, 10-12, 13-11). Earlier in the morning session of play, Hina Hayata had accounted for Romania’s Bernadette Szocs, the no.9 seed (11-4, 9-11, 11-9, 11-13, 11-9, 5-11, 11-5); rather more comfortably, Jeon Jihee had ended the progress of Japan’s Saki Shibata, the no.5 seed (14-12, 11-8, 11-9, 11-7). A near miss for Korea in the Women’s Singles event; in the Men’s Doubles competition it was a convincing success, Cho Seungmin and Park Ganghyeon, the no.7 seeds, overcame Russian qualifiers, Andrei Baibuldin and Vitali Murzin in three straight games to secure the title.